Sangamithra has evoked the excitement factor inside movie buffs after its launch at the Cannes. The team is currently busy with the launch and promotional works of the film at the Film Festival. 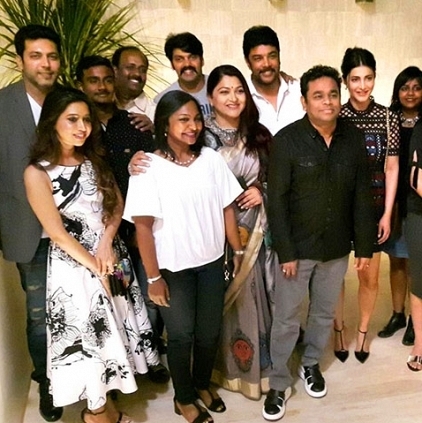 The film, starring Jayam Ravi, Arya and Shruti Haasan in lead roles, has music by A.R.Rahman. Funded by Thenandal Studios Limited, this epic film is directed by Sundar.C. During an interaction with the media at Cannes, A.R.Rahman revealed the core plot of the movie. When the question, "What is the story of Sangamithra about", was thrown to the acclaimed composer, he replied saying, "Well, the story is about a princess who wants to take a revenge". Shruti Haasan plays the titular role, and it is said that this role would be one of the strongest characters in the history of Tamil Cinema. However, he was reluctant to reveal more about the plot of the movie. People looking for online information on AR Rahman, Sangamithra, Shruti Haasan, Sundar C will find this news story useful.